Selous Safari Company has, for over 30 years, pioneered responsible tourism and authentic exploration of the more untouched areas of Tanzania. An important extension to this is the recent inclusion of Fanjove Private Island within its consummate stable of properties, also comprising Siwandu in the Selous, Jongomero in Ruaha and Ras Kutani on the Swahili coast. Fanjove has long been known as an exceptional jewel of the Indian Ocean, thanks to several important features. It offers exquisite natural beauty defined by azure seas, white sands and lush green palm trees. It is untouched by development and construction, except for an evocative 19th century lighthouse and discrete guest accommodation of natural materials. It is deeply rich in marine life, being blessed with 11km of coral reef extending around the island and benefitting from controlled fishing. 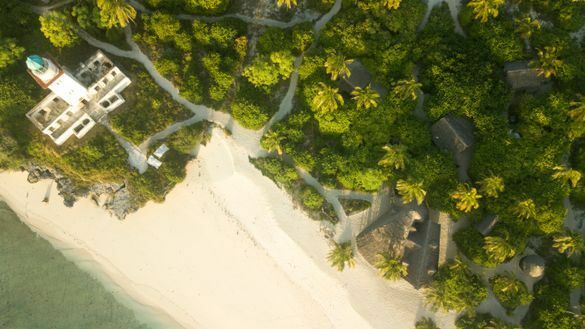 Moreover, the island is exclusive and reassuringly remote – the journey to reach it by light aircraft, then dhow, is part of the whole experience, and it will accommodate only a maximum of 12 guests at any one time. Previously run by Essential Destinations (ED), Selous Safari Company (SSC) was handpicked to take over management of the island by ED’s late founder, Nicola Colangelo. Colangelo knew Charles Dobie, SSC’s founder, well, and respected SSC’s unique approach. He was determined that, whilst Fanjove’s future should be protected by investment, it should not be over-developed or its natural beauty exploited for tourism. The intention was for Fanjove to remain discrete and unpretentious, and for its management to continue to respect the island’s history and relationship with the local community on Songosongo. After taking over the management of the island, SSC has set upon a process of gentle upgrade and refurbishment of guest areas where appropriate; considerable investment in sustainable sources of energy and water; and improvement of staff quarters and service areas. Most importantly SSC’s ownership brings its trademark approach towards exceptional customer service and guest experience, delivered by its outstanding, highly-trained team. A stay on Fanjove offers opportunities to capitalise on incredibly rich marine experiences – dolphin and whale excursions (which may include swimming with dolphin), snorkelling on the island’s native reef, fishing, bird watching, nature walks around the island, sand bank excursions and moonlit marine safaris. Freshly caught fish are a mainstay of the excellent cuisine, and meals may be taken on the open dining room decking, or down on the beach, each with uninterrupted views of the horizon and the Indian ocean. The lighthouse offers a powerful evocation of the island’s past and creates an unparalleled setting. The structure has been recently conserved, offering an unforgettable sundowner location, aloft its balcony, with a panorama of the island and the ocean beneath. Sundowners may also be taken aboard a dhow, or, if tides allow, on the sandbank. Siwandu, Selous Game Reserve- Sheltered in a grove of palms on the shores of Lake Nzerakera, part of the watery byways of the Rufiji River system, Siwandu is perfectly situated to experience fully the breathtaking landscape and abundant wildlife of Selous Game Reserve. The Reserve is the largest in Africa, spanning 55,000km² and is four times larger than the Serengeti. Jongomero, Ruaha National Park – Known for the rapids of the Great Ruaha River and its rugged landscape of undulating hills and rocky outcrops, Ruaha epitomises the definition of “Wild Africa”. The largest National Park in Tanzania, Ruaha covers a unique transition zone, where the Eastern and Southern biomes intersect, offering an extraordinary diversity of animals, plants and birds. Ras Kutani – This exclusive beach sanctuary offers a stark contrast to East Africa’s busier resorts. Beach, lagoon and a lush backdrop of virgin coastal, Ras Kutani supports and protects a rare ecosystem which boasts stunning waterbirds, over 132 varieties of trees and four species of monkey.